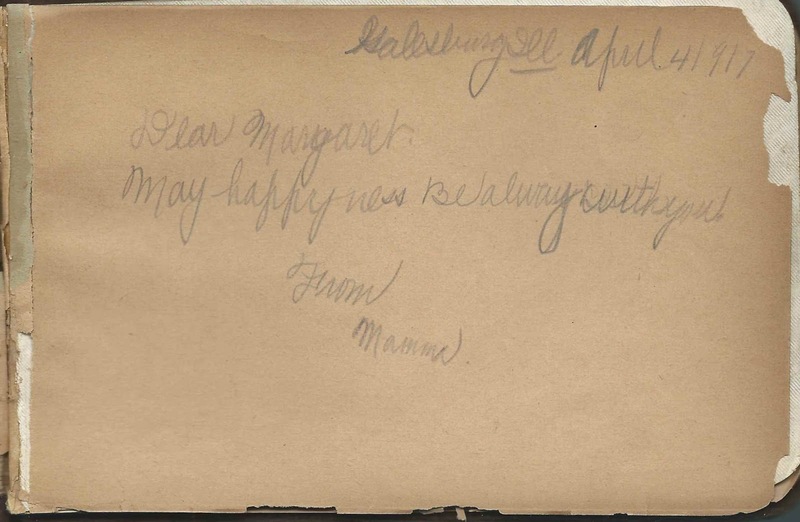 Autograph album that Sarah E. Kirk received at Christmas in 1894 and carried forward until 1918, with inscriptions from relative and friends from before her marriage and with inscriptions from her daughter Margaret Powell later on. 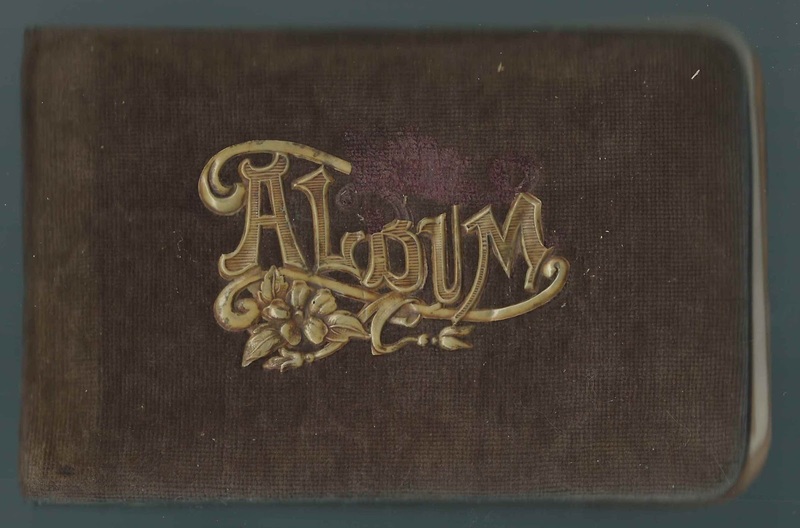 The puffy album measures approximately 6-1/4" by 4-1/4" and contains brittle paper with the sentiments of 20 of Sarah's relatives, friends and teacher. An alphabetical list of the inscribers, together with any personal information they offered, appears at the end of this post. 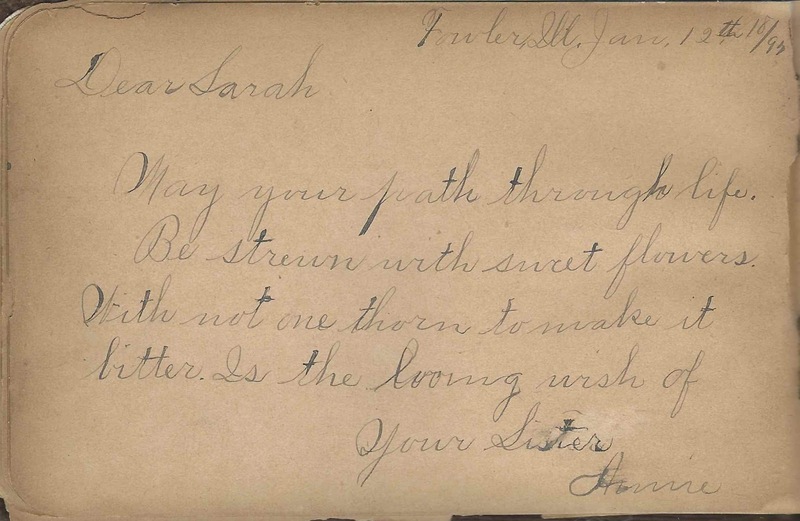 Sarah's older sisters Annie and Susie inscribed pages in her album. 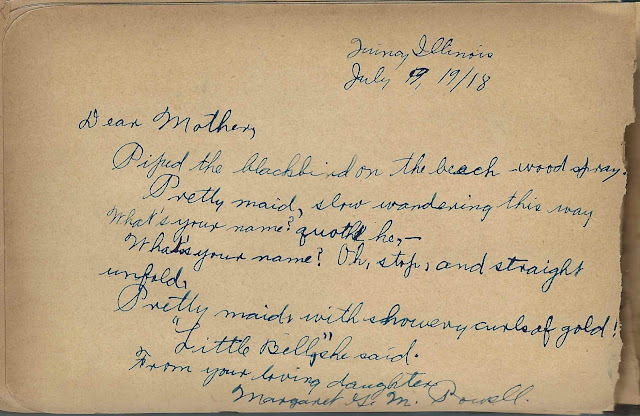 About 1907 in Adams County, Illinois, Sarah married Missouri native William E. Powell. 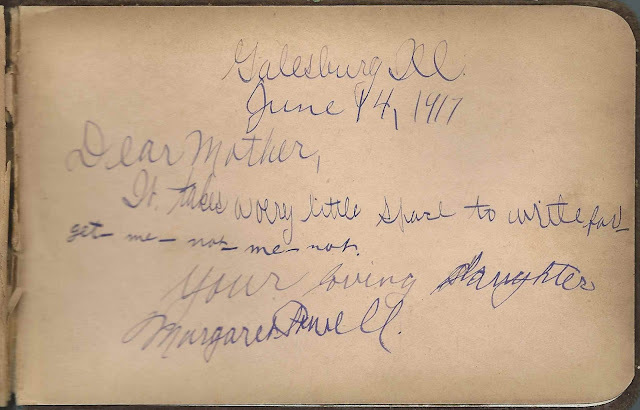 Their daughter Margaret, who inscribed pages in the album, and to whom Sarah inscribed a page, was born about 1908. William and Sarah will still alive at the time of the 1949 Directory of Galesburg, Illinois. The 1953 Directory lists just William. Ralph Farrell; inscribed at Fowler, Illinois, on February 7, 1895. Sarah's schoolmate. Florence I. Kendall; inscribed at Fowler, Illinois, on March 30, 1895. 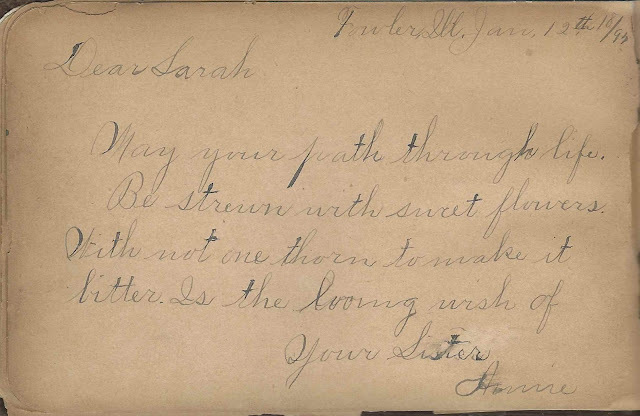 Annie; inscribed at Fowler, Illinois, on January 12, 1897. Sarah's sister Annie Kirk. 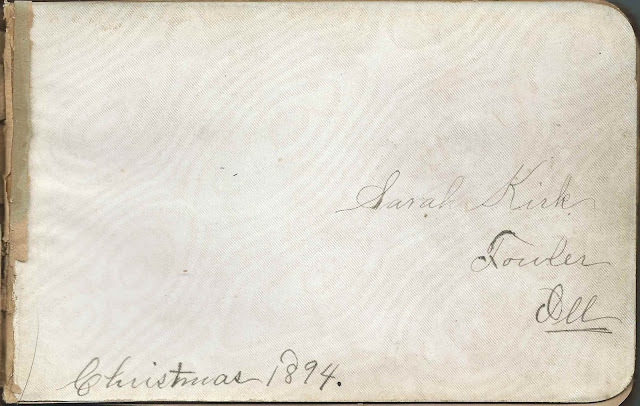 Sarah Kirk of Fowler, Illinois; Christmas 1894. Presumably a Christmas present for Sarah. Sarah inscribed a page to her daughter Margaret at Galesburg, Illinois, on April 4, 1917, and another page as Mrs. Powell at Christmas in 1917, after the album had apparently come to light again. Sue, "Your Sister"; inscribed at Fowler, Illinois, on November 22, 1895. 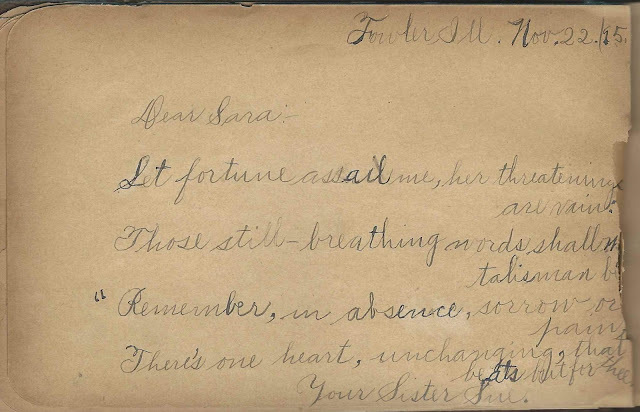 Sarah M. McGirr; inscribed at Quincy, Illinois, on March 18, 1895. George Pesch; inscribed at Fowler, Illinois, on November 15, 1895; perhaps the same George Pesch who inscribed a page at Fowler, Illinois, on the same day. George Pesch; inscribed at Fowler, Illinois, on November 15, 1895. 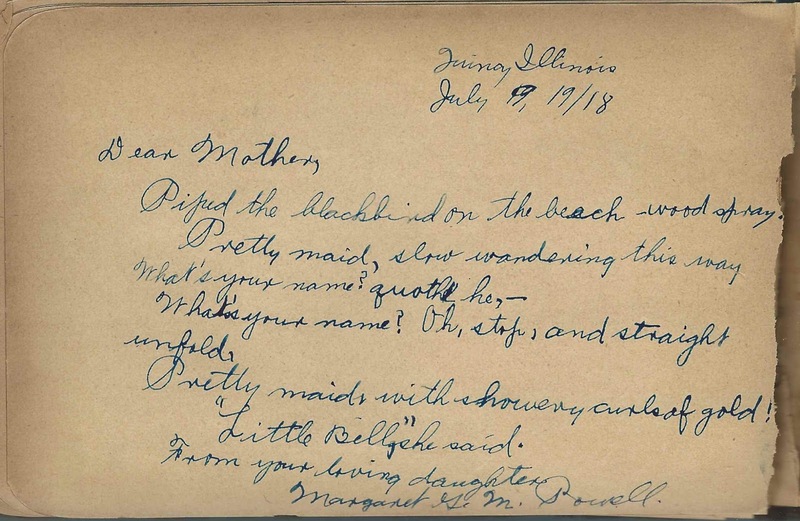 Perhaps the same George Pesch who inscribed a page at Fowler, Illinois, on the same day. B. N. Turpin. Sarah's teacher. 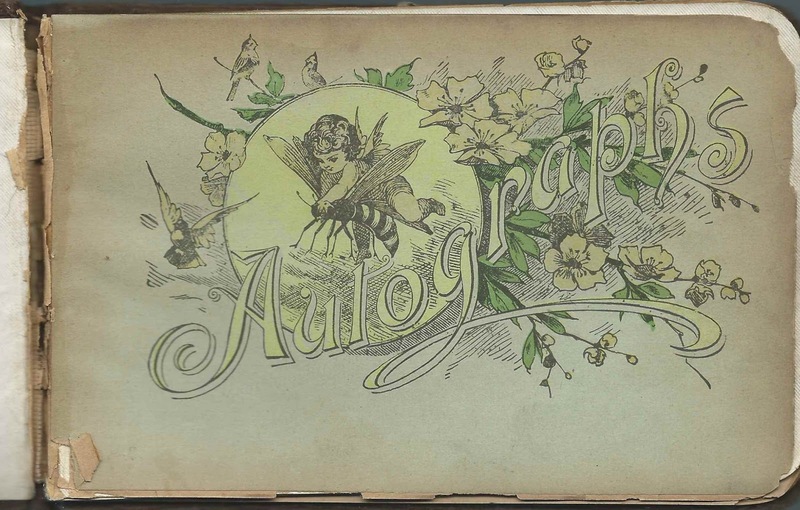 Possibly Bennett N. Turpin; if so, the woman who inscribed the facing page was presumably his second wife Nettie (Perkins) Turpin. Mrs. B. N. Turpin, who husband inscribed the left facing page as B. N. Turpin. He may have been Bennett N. Turpin; if so, Mrs. B. N. Turpin was presumably Nettie (Perkins) Turpin, Bennett's second wife. His first wife, Matilda (Cash) Turpin, died in 1887.